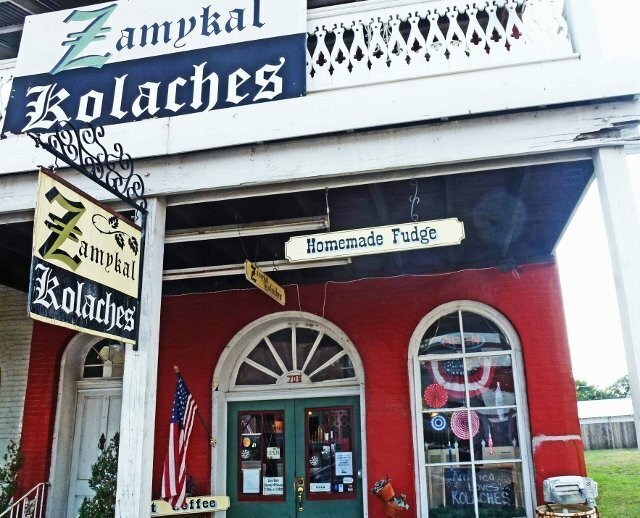 While driving through the small village of Calvert, Texas we saw a sign that declared “America loves kolaches” attached to a building housing Zamykal Kolaches. That was the 3rd sign we’d come across in Central Texas for kolaches but had no idea what they were. 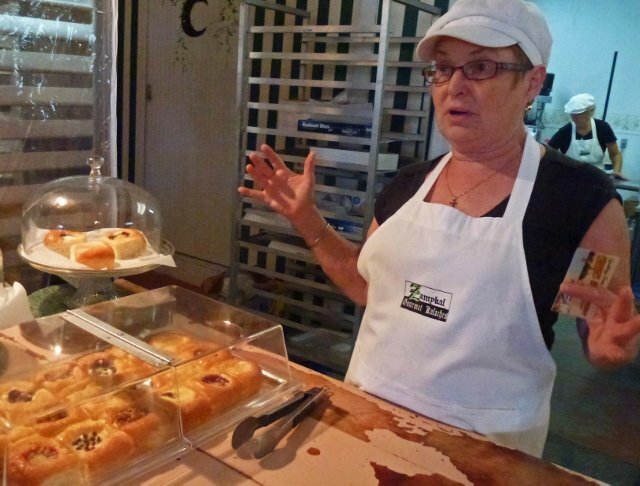 We were speaking with Judy Routh, who along with her sister Jody Powers are the Kolache Queens of Central Texas, baking their Czech grandmother’s signature century-old recipe that was brought over from the old country. Jody is out ill from the shop she started so Judy has held down the fort. 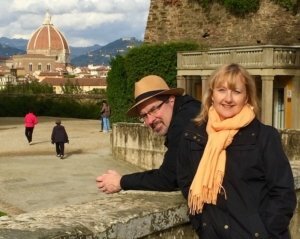 Despite a day that starts at 4 A.M., Judy is a bubbly personality who breaks into the “Kolache Song” periodically. Kolaches are a Czech pastry that are sort of like a Danish. It’s a square piece of a yeasty sweet bread with a dimple in the center. That dimple can be filled with all sorts of toppings; traditionally poppy-seed or fruit. 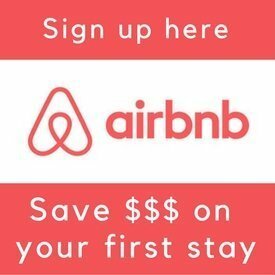 But here’s where you can let your imagination run wild. 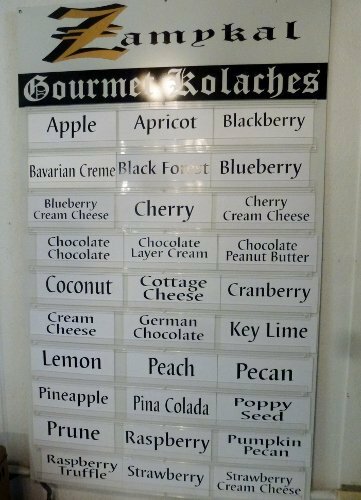 The bakers at Zamykal Kolaches (try saying that 5 times fast) make over two dozen varieties daily including: coconut, pina colada, Bavarian crème and my personal favorite, pumpkin pecan. They place an extreme emphasis on attention to detail; placing the mini-chocolate chips on individually for a better appearance. Just up the road from Calvert is the town of West, Texas. It made the news earlier this year when a fertilizer storage facility exploded, devastating the town. 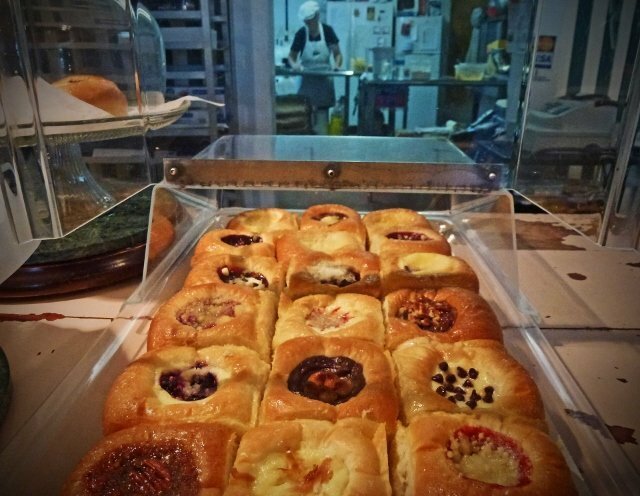 It’s been known for decades as the kolache capital of Texas. Some of the places there like The Kolache Factory offer savory ones filled with sausage and even bacon and eggs. But for me, sweet is the way to go. Anyone who reads my stories knows that I am a donut fanatic so I had to respond to that. 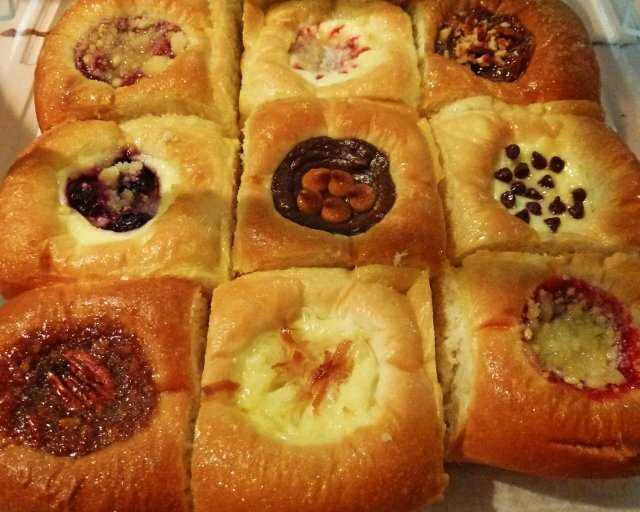 Kolaches are quite tasty, offering a light sweet bread with a creamy topping. Unlike donuts they aren’t fried so I’d imagine they are (marginally) healthier. But I don’t see chains of kolache stores spreading from coast-to-coast. They are a bit more delicate than donuts and require more care to make a good one. It’s hard to imagine the skill and care applied by the Kolache Twins working elsewhere. But is it fair to burden a pastry with being the next donut? For what they are, a light sweet treat, kolaches are quite delicious. Particularly at Zamykal Kolaches where they are artisan made. We ordered four and scarfed them down practically before we were out the door. If this gets you jonesing for a donut you may want to read the best donuts around the world. Update: We regret to report that co-owner Jody Powers passed away from her illness on March 1, 2015 and the business is now closed.